PropertyPages is the only site that has a Fair Listing Policy and Listing Guarantees. We do not cater to Real-estate Agents only or prioritize agent listings over private listings. With our Fair Listing Policy, we make sure that every ad will receive its fair share in the spot-light. Our unique listing guarantee will further extend the run-time of your ad if certain viewing goals are not achieved. Featured ad credits are part of the packages and do not expire after a few days or a certain number of views; they are valid for the whole duration of the subscription. To maximize your ad exposure, featured ads are also posted on our Facebook and Twitter pages as well as on our partner sites such as MalaysiaPropertyBuzz.my. While other portals offer to create and host your simple web profile with your listings, PropertyPages is taking this to a whole new level. Except for the basic packages, you will be able to create a fully, template driven website over which you have full control. 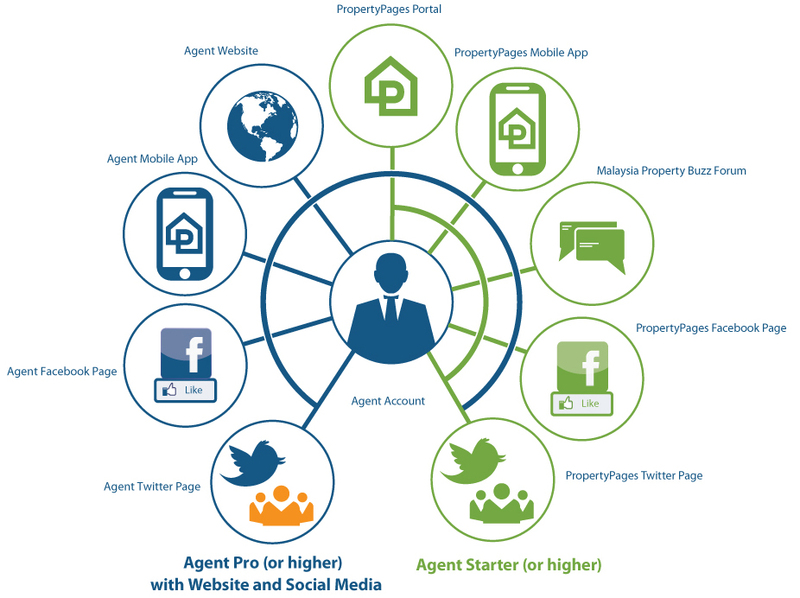 Your website will contain the same and more features as the leading Property Portals in Malaysia. View here for a sample (www.propertiesinpenang.com). With your own website, optimized for automated Twitter and Facebook postings you no longer depend on Property Portals but take full control of your own destiny and thus be on equal terms with everyone else. And if that is not enough, powerful email marketing tools, event management and professional brochure, flyer and catalogue creations are all part of the standard packages. NO ADDITIONAL FEES FOR FEATURED LISTINGS! Unlike other property portals PropertyPages does not use a credit based payment system charging you to keep your listings at the top. Featured Listing Quotas are valid for the duration of the subscription (1 Year). Within the Featured Listings Quota you are free to promote individual properties to featured status and change or rotate properties any time and as often as you desire. Detailed Agent / Agency Profile shown on PropertyPages. Profile will also be featured on partner sites, such as MalaysiaPropertyBuzz.my. More sites to follow in 2017. Creation of fully dynamic agent website on a shared domain such as propertyexperts.my/agent-name. Websites are fully customizable with over 20 different widgets, color styling and different themes to choose from. Use of own domain available as add-on. Concurrent listings that may be displayed on agent websites. The actual listing may be higher than the number of active listings on the agent website. Total number of active property listings on PropertyPages. Listings must be confirmed every 14 days. Unconfirmed listings also listed as featured will lose the featured status. Listings not confirmed within 30 days may be listed with lower priority and after 60 days will be deactivated on PropertyPages. Deactivated listings can be re-listed on PropertyPages and promoted to "Featured" once the listing has been re-confirmed. Total number of listings that can be listed as featured at the same time. Unlike other property portals, "Featured" on PropertyPages is not based on a number of featured views or days. It is for the whole listing period. Owners are free to switch between listings any time. Featured ads will also be posted on PropertyPages' Facebook and Twitter pages. 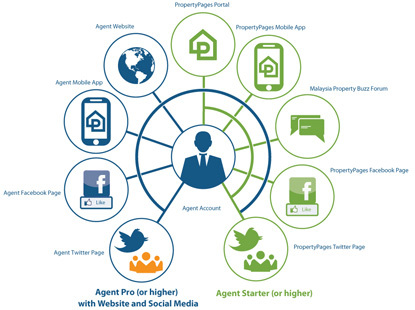 Properties featured on PropertyPages will also be featured on partner sites, such as MalaysiaPropertyBuzz.my. More sites to follow in 2017. The integrated email marketing tool "Marketing Mailer" allows agents to create email campaigns using fully customizable templates. Provides detailed campaign reading stats with lead ranking and import functions to create large mailing lists. Personal and professional Facebook and Twitter fan pages setup and maintained by PropertyPages to enhance agent visibility on the internet through social media marketing. With auto-posting and auto-re-posting for hassle free operations. Manual posting enabled for custom content creation. Optional, but recommended use of own domain like www.example.com for agent website. Includes SSL Certificates for secure website connections and one mailbox on own domain with 1GB of storage. Additional mailboxes available as add-on. Agent accounts may apply for a total of two (2) Free Condo Specialist of a condo of their choice. Each condo only allows for four (4) condo specialists of which only two (2) will be fee. Free condo specialists are awarded on a first come first serve basis. Free Condo Specialist will only be offered for the first year. Account can be linked to an Agency / Group (Container) account which is an independent website receiving all listings from linked accounts. For more information see Agency / Group Packages. Property enquiries are forwarded immediately to the agents. Contact information of enquiries from PropertyPages can be added to a contact manager. Contacts can also be exported as vCards or QRCodes. Statistics of property enquires are collected and made available to the agents. Detailed viewing statistics including geo-location information for each property will be provided in near real-time. Through the PropertyPages mobile app agents will receive instant push notifications of incoming inquiries. Professional Property Catalogues with up to 120 properties can be created and customized within minutes using ready-made templates. Agents can schedule Open House events which will be displayed on PropertyPages or the agent website in nearby searches. Website Visitors can easily contact agents that are close to their locations to arrange a property viewing. Content Management System (SMS) designed and developed specifically for real-estate websites. Easy to create and manage websites. Zero Administration. Agents may select from different themes which are inter-changeable. Sites can be styled individually to create a unique look and feel. E.g. corporate colors. Text searches or nearby searches provide search functionality only found on large property portals. Integrated News Letter sign up form to allow agents to create newsletters using templates of the Marketing Mailer. Over 20 different widgets such as loan calculator, quick search, contact, twitter, open house, testimonials etc. can be easily added to the website. Pages can be configured individually. Websites are search engine optimized. Simple management and integration of web traffic analytics code snippets (default google). Websites monetization through integrated Google AdWords or Ad Widgets. Access to large image libraries to assist in creating web pages. Offer the full Condo and New Projects directory to your own users and look like a large portal. Offer price statistics and price trends on your website. Price statistics are based on PropertyPages overall statistics. SmartRealtor provides manuals, tutorials and webcasts to help with all aspects of creating and managing property listings, websites or other modules. Chat support will be provided during business hours. Emails support will be provided for general enquiries. Support to configure domains, mail boxes and the creation an initial base website. Creation of custom logos, banners or content will be provided as add-on service. Domain registration on behalf of agent will be provided as add-on service.